Thanksgiving at our house this year didn't include the traditional trappings of the holiday. We had no turkey. No stuffing. No large gathering of extended family or friends. Most of us were unable to eat much at all due to a stomach bug tearing through the household. But Thanksgiving isn't really just about food, is it? It's about giving thanks - remembering the One from whom all blessings flow, and giving voice to gratitude. So this year, as we listed blessings and thanked God for all He's given, my heart was so full! 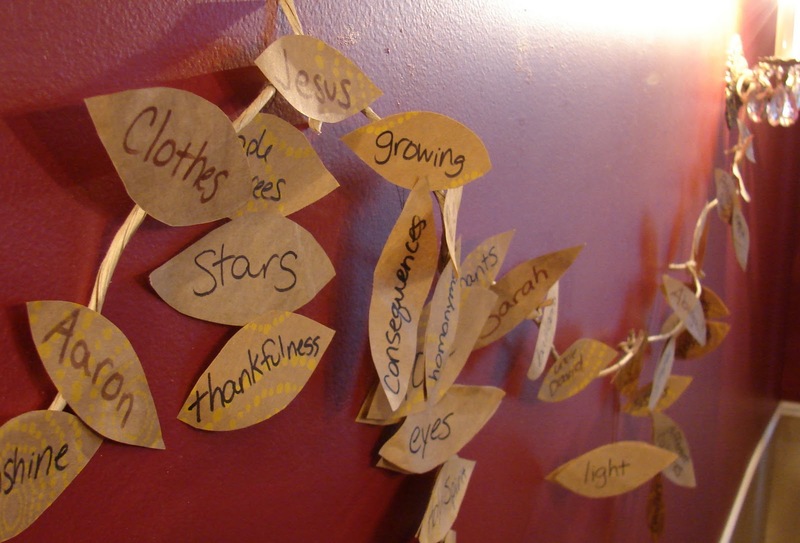 We hung up our garland of gratitude, each leaf one thing we're thankful for, as a visual reminder of the goodness and faithfulness of God.